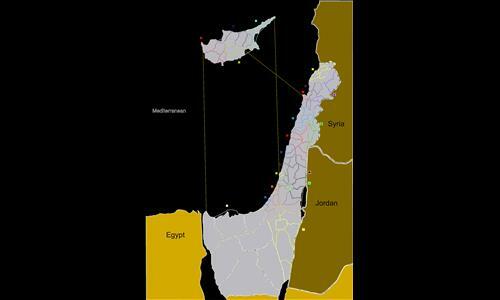 The Lebanese Israeli Wars is an intense medium map of the east Mediterranean. Ideal for 2 players/teams (1 v 1, 2 v 2). The capitals are of huge importance, not only psychologically, but also strategically and economically. Cyprus is key for the control of the Mediterranean naval battle, while Golan offers the only way around the epically hard to crack border buffer zone between Lebanon and Israel. Check out the various distribution modes for some legendary battle scenarios. Review by ArmyKorps on 3/21/2012. Review by Dutch on 6/4/2012. While interesting, its bonus distribution is terribly uneven, making it an easy win if you place your starting spot in Tel Aviv and/or Beirut. Hi @Dutch thanks for the comment. the bonus distribution placing a heavy weight on the capitals was intentional, being a small map i wanted to give it a special twist and place extra importance on the capitals. in a 1v1 game or 2v2 (which is what this map is designed for) it shouldnt be a problem, especially if you use the scenarios. Review by brokehiselbows on 12/1/2012. Very Enjoyable, with a variety of scenarios available. Great for a quick game! Two thumbs up! Review by shmulelyrap on 10/13/2012. Review by BloodBath185 on 3/27/2013. Review by Landalf on 9/2/2013. Interesting, but the games has many chances of falling into a stalemate. Which it happen to me. Review by papaveve on 10/22/2014. Review by ironhalo on 12/15/2014. Review by huangpo on 10/31/2012. Played it in single mode. I think it would be ideal as a 3 player mode; one player in the south, one in the north and the last on the island.